A decision is expected next month in the case of Philippines v. China, currently before the Permanent Court of Arbitration in The Hague. While we do not know what the court will rule it does seem how the Court decides to dispose of the issue of Itu Aba will be critical in deciding what the real world impact of the case is. When the Court accepted jurisdiction over the case, it made clear that it would not be deciding which country owned the various disputed maritime features of the Spratly Island chain. The court will be deciding whether China’s nine-dash line violates international law, and this is the issue that has received the bulk of the media coverage of the case. But there is another issue the Court is expected to rule on that will matter nearly as much. While the Court won’t be deciding whether any of the disputed features belong to China or the Philippines, it is expected to decide what maritime entitlements each feature in the Spratlys is entitled to. It remains disputed whether the Spratlys are rocks, which are entitled to only a 12 nautical mile territorial sea, or islands, which carry a 200 nautical mile exclusive economic zone (EEZ). Because China will still be able to maintain its claim to the Spratlys even if it loses the case, the decision on what maritime entitlements individual features have will matter a great deal. If even one of the Spratlys is found to be an island entitled to a 200 mile EEZ, China will be able to plausibly claim that it owns that feature and the 200 mile entitlement that comes with it, a claim that, while not as large as the nine-dash line, would still be quite substantial. This is where Itu Aba comes in. Itu Aba is a feature in the Spratly Islands spanning about 110 acres in area, or about one-fourth the size of the average American farm. But small as it is, Itu Aba is still the largest natural feature in the Spratlys. If any feature in the chain is going to be declared an island entitled to an EEZ, Itu Aba is the leading candidate. The Court won’t just look to Itu Aba’s size when making its decision. It will consider other factors recognized under international law, such as whether Itu Aba has a potable water supply, whether it can support agriculture, and whether it is suitable for permanent settlement. There are facts on each point that support the argument that Itu Aba is an island. Itu Aba has ground wells that produce fresh water; there is a functioning farm on the island; and there is a long-term population of about 100 people. It is entirely possible the Court could find that Itu Aba is an island. If it does, China will be in a position to continue to claim Itu Aba and its 200 mile EEZ. The politics of Itu Aba are further complicated by the fact that it is claimed by more than just China, the Philippines, and Vietnam. The island is physically occupied by a fourth claimant – Taiwan. Taiwan’s status under international law has been in limbo for decades and it remains unclear whether or not it is a country that has any standing in international venues to claim Itu Aba (known in Chinese as Taiping Island). It is China’s position that any claims by the Republic of China (Taiwan) rightfully revert to the People’s Republic of China (Beijing). This leaves Taiwan in the position of making a territorial claim that bolsters the PRC’s position in the South China Sea and puts Taiwan in the rare position of being at odds with the position of the United States on a security issue in Asia. At the center of this complex web of claims and claimants sits a small maritime feature that even many of the most attentive followers of international affairs have never heard of. When the Permanent Court hands down its final decision later this spring, its decision on Itu Aba may be its most important. 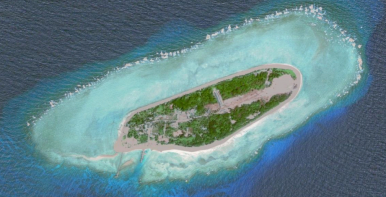 If the Court finds that Itu Aba is an island, China will continue to have a plausible claim to a large swath of the South China Sea – a claim that, ironically, will be backed up by Taiwan – even if its claimed nine-dash line does not survive. If, on the other hand, the Court finds that Itu Aba is merely a rock, China’s maritime claims will have been dealt a massive blow.